Th ExtraCarry is light and has beveled edges at the bottom for ease of wear and less visibility. Carrying an extra magazine is a concealed carry best practice, yet few people do it. Although I do tote a spare mag in the front pocket of my jeans on most days, I’ll admit extracting it from a cargo pocket is a clumsy process—the opposite of what would serve me in a gunfight. New on the scene to remedy the situation is the ExtraCarry magazine pouch. 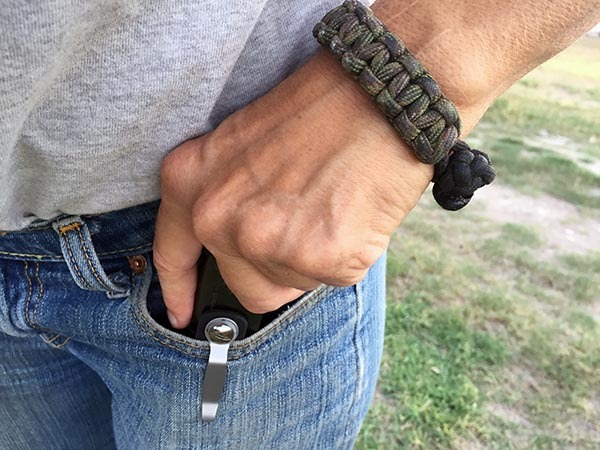 Made of pliable plastic with a metal clip, it was made for use in a pocket to keep that extra ammo right where it belongs—accessible and properly indexed for use. Each of the pouches is customized for your model of firearm. Most popular carry-gun models have an ExtraCarry to match their mags. 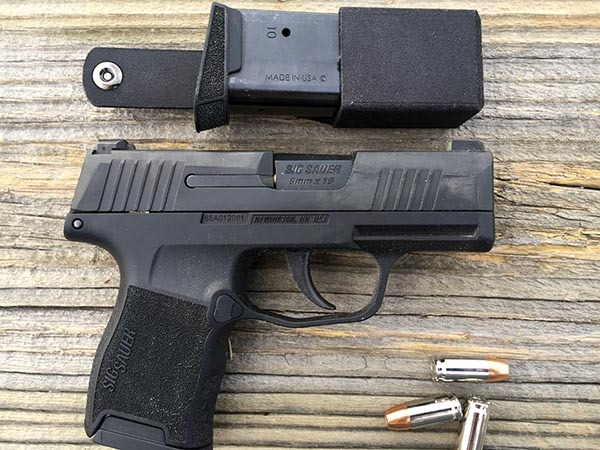 The model in this test is for the Sig Sauer P365 mags, albeit the 12-round variety when mine hold only 10—an example of how customized each ExtraCarry is. Each ExtraCarry is stamped with the make and model of the gun and accompanying magazines. On the outside—which is to say, the visible side when worn—is a simple metal clip that lends the appearance of wearing a folding blade when the device is carried. The clip rotates on its attachment point at the top of the pouch, making It easy for the wearer to choose the perfect angle of carry inside the pocket. 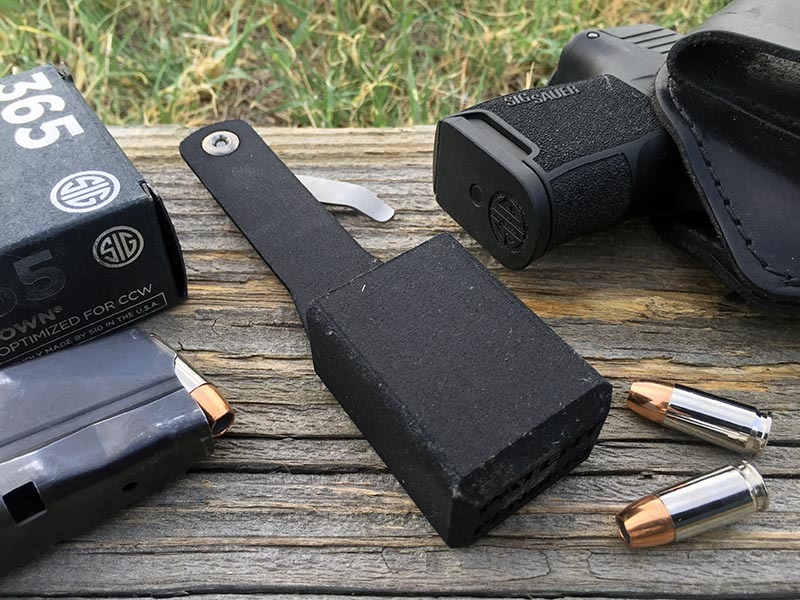 The holder itself, at least for the Sig pouch in this test, a simple, two-inches-deep cup that closely fits the contour of the mag. Corners of the cup are beveled for comfort and, ostensibly, to prevent printing. While it adds a minimum of bulk to the profile of the mag itself, the cup has no retention other than gravity. In other words, if you go break dancing while armed, don’t be surprised when the mag goes sliding across the floor as you lay down your best moves. ExtraCarry clip as viewed from the side. Retention is very strong when it comes to the risk of losing the device if not the mag. In this test, I spent a couple weeks wearing—and in two cases, only trying–the ExtraCarry on several different brands of pants, jeans, and shorts. Of course, everyone is shaped differently and another tester could have a very different experience. This is just a description of mine. Out of the package, retention on the clip (and I do mean the clip on the product, not the magazine) is very tight. So tight that it takes some effort to guide it over the pocket hem on some pants. That’s kind of comforting; though the device exerts no retention on the mag, I’m confident the whole works won’t come off unintentionally. On the other hand, the rotation of the clip to achieve a certain angle in the pocket is probably set at about five pounds of pressure. 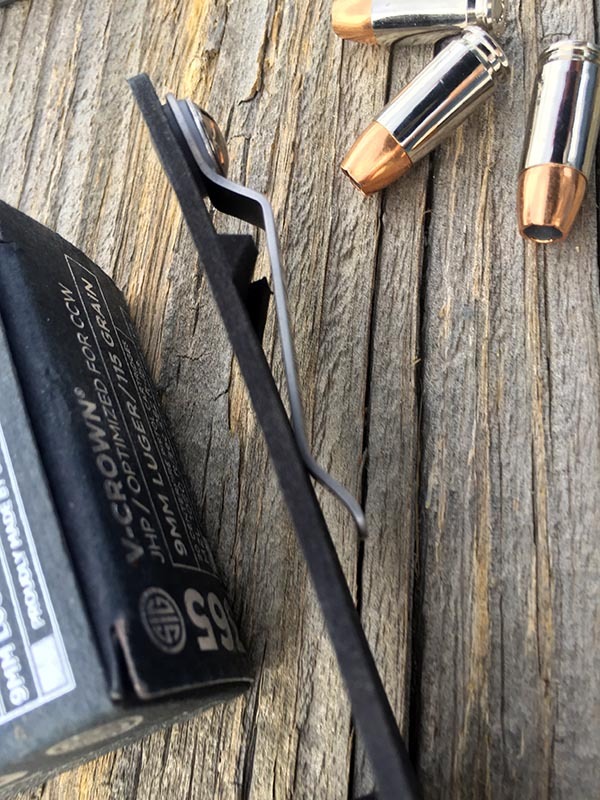 While this seemed tight enough, I found the motion of my body would push the clip to a different, and consistently more comfortable, angle than what I’d set. Drawing the mag properly was easier with the combination of jeans and the ExtraCarry. At least with some pants, the downside of this unintentional angle change was increased printing, at least with jeans. Printing wasn’t a problem with looser-fitting cargos. The advantage of wearing the ExtraCarry with jeans, at least the kind I wear, was the ease of drawing the mag from the pocket, whether standing or sitting. It’s counter-intuitive, but getting a solid grip on the mag, with my index finger on the front, was easier with the smaller and comparatively shallow jeans pockets. The smaller front pockets on my jeans also offered easier extraction of the mag when I was seated. If I could change one thing about this product it would be to reduce its visible profile when worn. 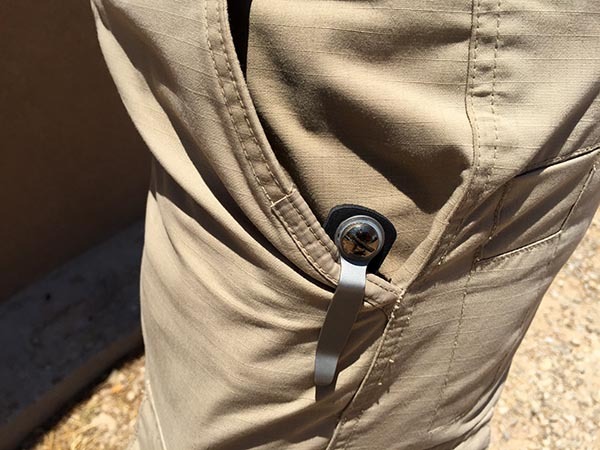 Tactical pants and cargo pants carried the device without printing, and comfortably. However, drawing from a pocket took some effort, as these deep pockets seemed to swallow the magazine and required that I grasp the floorplate with my fingertips and fish it out to the edge of the pocket where I could then get a secure hold. With these deep-pocket pants, drawing the mag while seated took more effort than with jeans, but still less effort than fishing for a loose magazine in the pocket. Did the ExtraCarry make carriage of an extra mag better for me compared to having it loose in a pocket? Yes. Even in pockets where “fishing” was required, the mag stays in ready position inside the pocket. I do have some concern that the mag could fall out, unbeknownst to me, were I to do physical gyrations when wearing it with shallow-pocket pants. If you’re a female wondering if it’ll work with the microscopic pockets on most women’s pants, don’t count on it. A 10-round mag in a 12 round pouch It's as long as the pistol itself. I liked the way the ExtraCarry kept my mag ready in the best, most consistent position possible with street pants. The only thing I’d change, if I could, is to shave off the top of the device to lower its visible profile. An area an inch wide, and a sliver more than half an inch tall, protrudes outside the pocket. The ExtraCarry can be ordered direct from the company website. Each pouch is $55, but new subscribers to the company email list get 10 percent off. 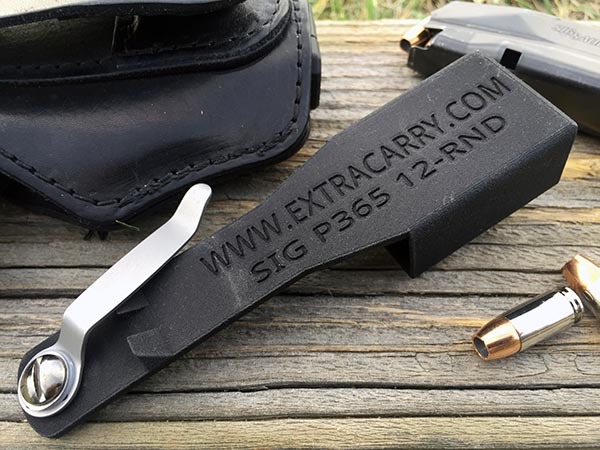 Thanks for taking the time to review the ExtraCarry Mag Pouch for the Sig P365. Nice review Eve. Looks like a really good idea but I was shocked to see the price of $55. I don’t think I could spend that much on this product as you’d have to have one for each pistol you own. Lower the price Rick and you’ll sell many more I feel.